There are 3 scenarios when adding a new report. The first is if the report did not originally exist. The instructions for this are explained below. If, however, the report did exist before, and some changes have been made to it, the new report only needs to be copied to the location mentioned in step 1. It is recommended to back up the original first. The 3rd scenario is, if the report existed, but you wish to launch a new report in its place. In this case, the new report needs to be copied as per step 1, but then the Report Alias (6) will need changing to reflect the new name. This is often done with Payslips, Statements…, so that changes to the initial report will not impact on your customised version. It is also used if trialling a new report format so that it is easy to revert back tot he original report. Reports can be restricted to be seen ONLY by people with a particular Security Group/s. If left blank, it can be seen by all users. This option is utilised by Spider only. This option is used to hide a report from a list so it can re re-enabled at a later date as opposed to deleting it. 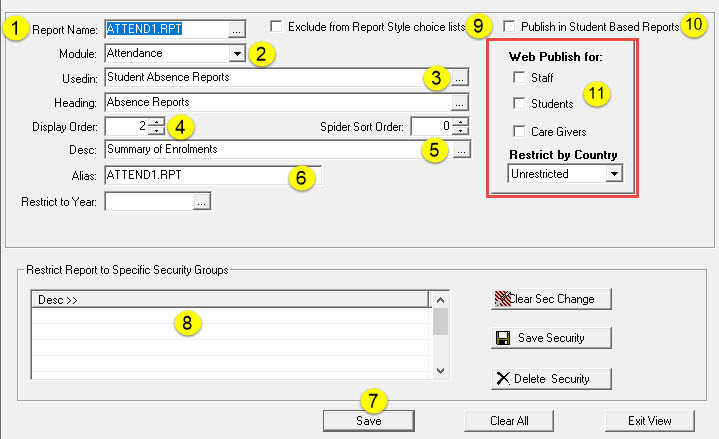 It helps reduce the number of reports seen by the user by hiding reports that will not be used by your school. 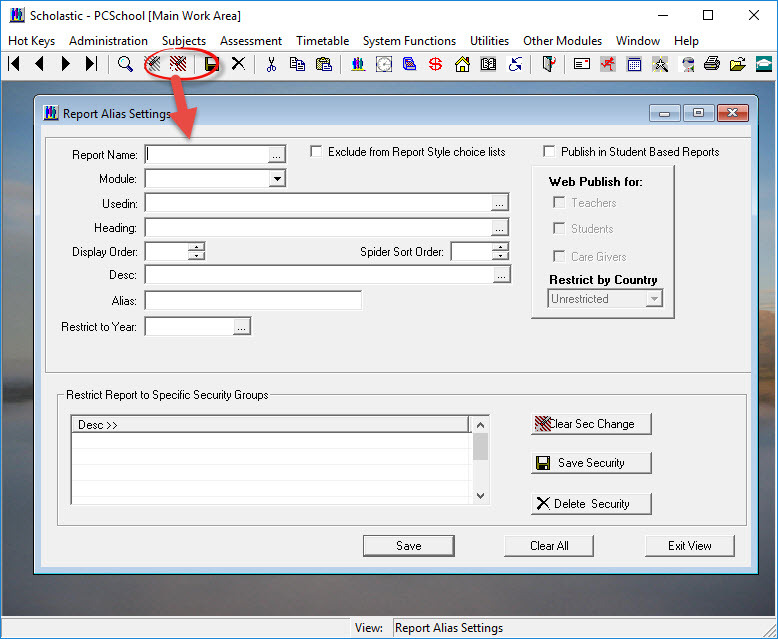 This option presents a report under the “Class Reports” launch area. Only reports related to a class can be selected here. These are generally student based reports. Reports by default do not show in Spider. To make them available, schools need to check the box next to the type of user can see them. 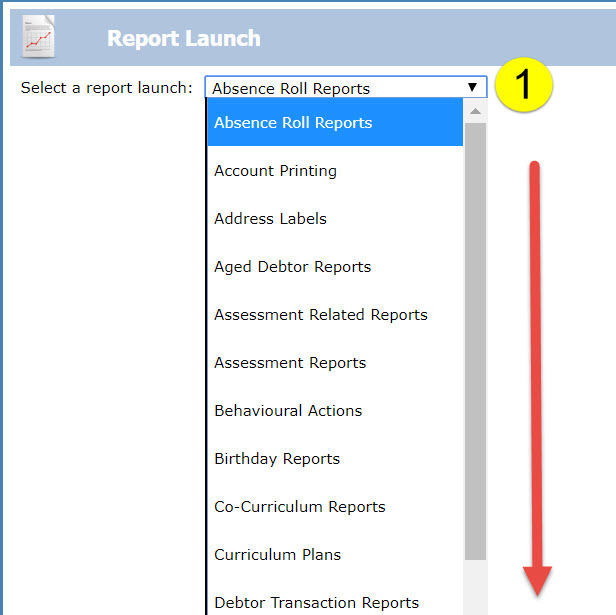 This ensure the available list of reports is specific to your school. In most cases it will be for staff however some schools allow caregivers to see certain reports. It is important to realise that if you do publish a report to caregivers, they will see the data as it is at time of printing. It is recommended not to publish Academic Reports as they are likely to be viewed prior to proof-reading and final checking by staff. You may need to refresh PCSchool for the report to show. Some controls in Spider will show the relevant reports based on its functionality. All reports, however, are available from the “Report Launch” control. You will need to choose the appropriate launch to see the report. Choose the launch that the report will appear under.